July 13, 2017, 2:09 p.m. 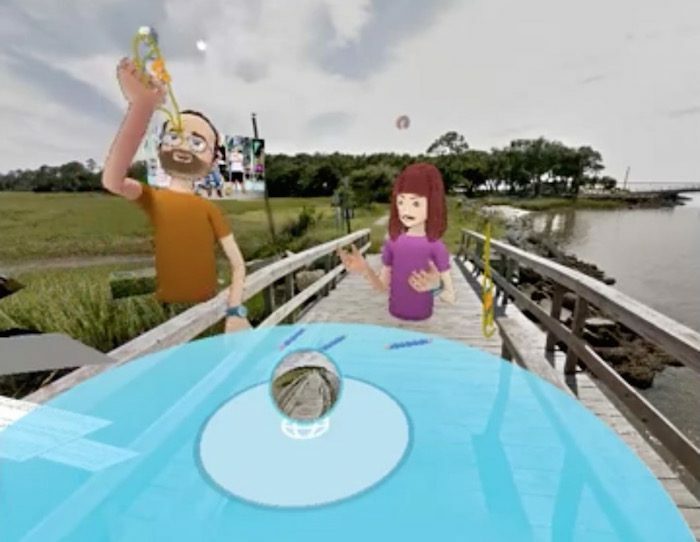 The show, called Conundrums, is broadcast using Spaces, Facebook’s app that allows users to interact with each other in virtual reality. By Joseph Lichterman @ylichterman July 13, 2017, 2:09 p.m. If, hypothetically, Georgia and Florida went to war, which state would win? That was one of the questions posed to actress Carrie Preston in the first episode of Conundrums, Slate’s new virtual reality Facebook Live talk show that launched Thursday. Preston and host Dan Kois, Slate’s culture editor, were presented as legless avatars as the show is produced using Facebook’s VR app Spaces, which was launched earlier this year as a way for Oculus Rift users to interact with each other as avatars. Facebook this week announced that it was adding a livestreaming feature to Spaces, and Slate says it is the first outlet to utilize this platform in this way. Kois and Preston began their conversation outside of a Brooklyn-based brewery that’s sponsoring the show before using the magic of virtual reality to transport themselves to Jekyll Island, Georgia — one of Preston’s favorite places in her home state. “Hey, that’s Driftwood Beach over there,” she said as the pair arrived on a boardwalk. The show was streamed from the perspective of a third avatar, a Slate producer, who controlled the locations and camera angles and also tried to help Preston when she had trouble operating some of the Spaces functionality. Slate was able to resume the broadcast a few minutes later in a new video — “I was skinnydipping, sorry I’m back now,” Preston joked as the show came back — but the technical difficulties underscored the experimental nature of the show. In fact, Slate’s first attempt at broadcasting the show cut out about a minute and a half in and they had to continue the broadcast in a new stream. For Slate, this is a relatively low-risk way for the online publisher to dip its toes in the VR waters. Speaking to Digiday in May, Slate product head David Stern said the company was taking lessons from its successful podcasts and trying to implement them with VR. That meant focusing on conversations and publishing on a regular schedule. “Podcasts taught us, you got to create that habit,” Stern said. Slate is considering the show an experiment, but it’s going to try to continue to ask guests those wacky questions on a weekly basis while also finding ways to build an audience (and eventually monetize it). POSTED July 13, 2017, 2:09 p.m.
Lichterman, Joseph. "Slate’s first virtual-reality talk show was “a hilarious disaster”." Nieman Journalism Lab. Nieman Foundation for Journalism at Harvard, 13 Jul. 2017. Web. 19 Apr. 2019. Lichterman, Joseph. "Slate’s first virtual-reality talk show was “a hilarious disaster”." Nieman Journalism Lab. Last modified July 13, 2017. Accessed April 19, 2019. https://www.niemanlab.org/2017/07/slates-first-virtual-reality-talk-show-was-a-hilarious-disaster/.